A closer look at the day's most notable stories with The National's Jonathon Gatehouse: it's proving difficult to make a dent in U.S. gun culture; Rukban refugee camp in southeast Syria gets desperately needed aid; as we approach the pinnacle of awards season, the big shows are facing problems. It's proving difficult to make a dent in U.S. gun culture. Rukban displacement camp in southeast Syria finally gets desperately needed aid, but daily life remains miserable for the refugees. As we approach the pinnacle of awards season, the big shows are facing problems. It's been almost a year since 17 staff and students were killed at Marjory Stoneman Douglas High School in Parkland, Fla., in what ranks as America's ninth deadliest mass shooting. The survivor-driven movement that followed drew hundreds of thousands to the streets to protest for tougher firearms laws, and helped elect a new generation of pro-gun-control legislators to state and federal office in last November's midterm elections. But it's proving difficult to make a dent in U.S. gun culture. In 2018, 27 states passed a total of 67 new gun control measures. Yet only two states — California and New Jersey — received an "A" grade in the annual gun control report card issued today by the Giffords Law Center to Prevent Gun Violence. Five others — Connecticut, Maryland, Hawaii, New York and Massachusetts — received "A-" grades, while Washington and Illinois got a "B+" ranking. Florida earned a "C+", passing for the first time due to some post-Parkland restrictions. In comparison, 22 states received failing grades of "D" or "F", with Mississippi ranking 50th for gun control and fifth for firearms deaths. A new Ipsos/Reuters poll, released this morning, confirms that a solid majority of 69 per cent of Americans — including 57 per cent of Republicans — want stronger gun measures. Although only 14 per cent of gun control supporters say they are "very confident" that their elected representatives understand their views, and just eight per cent trust politicians to actually take action. 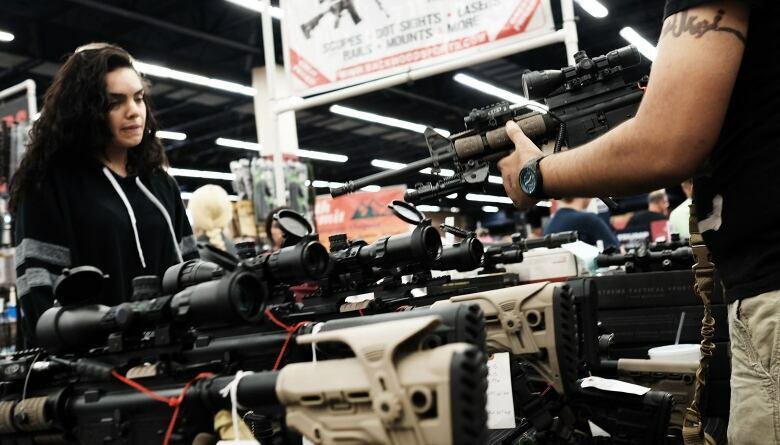 The survey of 6,800 voters found wide agreement on the need to expand background checks, stop people with mental health issues from purchasing firearms, and ban internet ammunition sales. It also found support for Donald Trump's approach to stopping school shootings, with 61 per cent of parents of school-age children saying they favour publicly funded firearms training for teachers. This year will be a crucial test for American gun control advocates. At least 50 major pieces of firearms restriction legislation have already been introduced in State houses. Democratic governors in California, New York and Illinois are moving to strengthen their already tough measures. And there is bipartisan support in almost two dozen states for bills that will stop convicted domestic abusers from buying guns, or so-called "red flag" laws to allow police to temporarily seize weapons from people who might pose a danger to themselves or others. In Washington, D.C., the new class of House Democrats flexed their muscles this week with a rare congressional hearing on gun violence, paving the way for the introduction of legislation to expand background checks to internet and gun show sales. 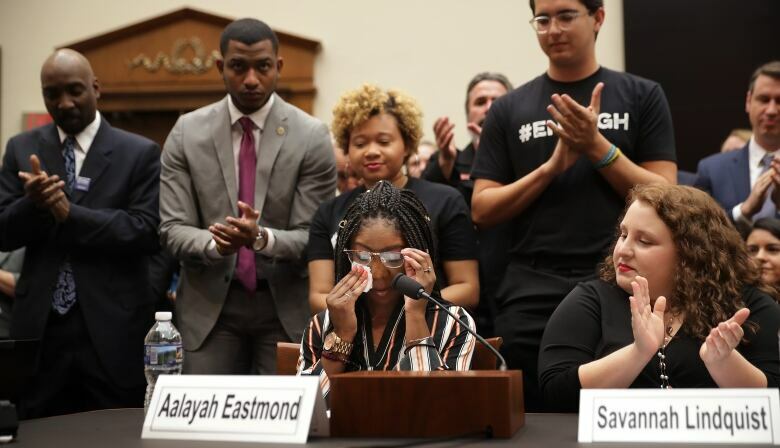 Aalayah Eastmond, a Parkland senior who survived last year's massacre by hiding underneath the body of a slain classmate, testified in favour of stricter measures, receiving a standing ovation. Republicans countered with Savannah Lindquist, a sexual assault survivor and gun rights backer. 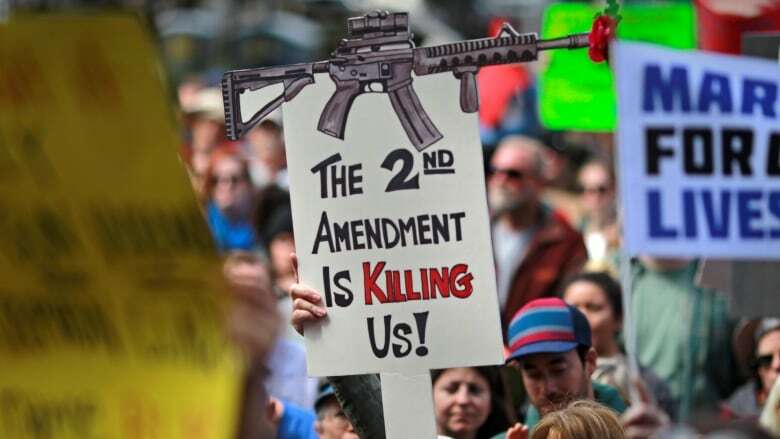 The eventual house bill is likely to suffer the same fate as the last major federal gun control efforts in the wake of the 2012 Sandy Hook school shooting, with Senate Majority Leader Mitch McConnell saying it is "highly unlikely" to pass in the upper chamber. And there is apprehension about what the new conservative majority on the U.S. Supreme Court might do to existing gun control legislation, as it prepares to weigh in on a challenge to a New York City regulation that limits how and where firearm owners can transport their weapons. Meanwhile, the Trump administration has been busy making it easier for U.S. arms makers to export their semi-automatic assault weapons, flamethrowers and grenades to overseas customers, doing away with the need for State Department licences. And while the gun debate rages, the violence continues. There have been 41 mass shootings in the United States over the first 39 days of 2019, which have resulted in 62 deaths and 128 wounded. The Rukban displacement camp in southeast Syria, near the borders of Jordan and Iraq, is home to almost 50,000 people who have fled the fighting between rebels and the Assad regime. But despite the fact that it sits in a U.S.-military protected "deconfliction zone," it has been almost impossible for international organizations to access the settlement, and its inhabitants received just two aid shipments in all of 2018. This winter has been harsh, and a number of children have died from illness and the cold. On Wednesday, the UN and the Syrian Arab Red Crescent reached Rukban with 133 trucks filled with supplies — the largest aid delivery to date. Q: What's the situation like in Rukban? A: It's quite a dreary existence. The conditions are harsh. It's been raining almost constantly and the ground has turned to mud. And since people are living in huts made from mud, the rain is literally eating everything up. Q: How have people been coping since the last aid shipment in November? A: People have been eating fewer meals, maybe two or just one a day, they tell us. Some tea for breakfast and then some potatoes or dry rice. That's it for the day. Q: Why has it been so difficult to get aid to the camp? A: It's in a really remote location and the people are basically trapped. We've been advocating for access and we finally got it. The UN has to liaise with all of the parties on the ground, because we need guarantees that the road, and our vehicles and staff, will be safe." Q: How long will this aid shipment last the people in Rukban? A: About a month, in terms of food. Maybe three months for the kids. It's by no means a lasting solution. Q: What's the biggest challenge going forward? A: People here have been displaced from all parts of Syria. They've lost their belongings. And it's almost like they're living out in nature. They are desperate. The food will sustain them, but something has to change. They can't stay here indefinitely. We're approaching the pinnacle of awards season, with the Grammys this Sunday, the Oscars in a couple of weeks, and the Junos and Canadian Screen Awards (formerly known as the Genies and the Geminis) next month. However, the sprawling production- and celeb-heavy events are in trouble, writes producer Tarannum Kamlani. Music's "biggest night" is coming to your TV screens this Sunday. Maybe you're excited, maybe you're resignedly setting your PVR, or maybe — like an increasing number of viewers — you're giving the whole thing a hard pass. I'm referring, of course, to the Grammys. The show's producers and its host network, CBS (Canadian viewers can watch it on CityTV), are surely hoping and praying that people watch. The audience numbers in the past few years have been in decline, part of an overall turn away from conventional TV programming. But tanking numbers tell only part of the music award show's woes. It is also suffering a more existential crisis — do the Grammys really matter? Getting one is great, but is it still the career-making milestone it once was? Take the case of Ariana Grande. She's had her biggest year yet, with her smash hit album Sweetener. But she has dropped out of performing at or even attending the Grammys this year after the show's producers "insulted" her. Grande is not the only major star who won't be there. Beyonce and Jay Z are taking a pass. Grammy favourite Taylor Swift won't attend. Nor will Kendrick Lamar and Drake, both of whom declined performance slots (perhaps not a huge surprise, since the Grammys have gotten hip hop wrong for decades now). And then there's the Oscars show, which is facing a similar crisis. Job one has been to figure out how to widen its diversity and cultural appeal. The Academy of Motion Picture Arts and Sciences, which hands out the awards, has tried and often failed to find a more audience-pleasing footing. You might remember the introduction of the "achievement in popular film" category, which got put on ice after being almost universally panned. Then there's the issue of the host — this year's show won't have one. The show tried that once before and it was, in most people's minds, an unmitigated disaster. 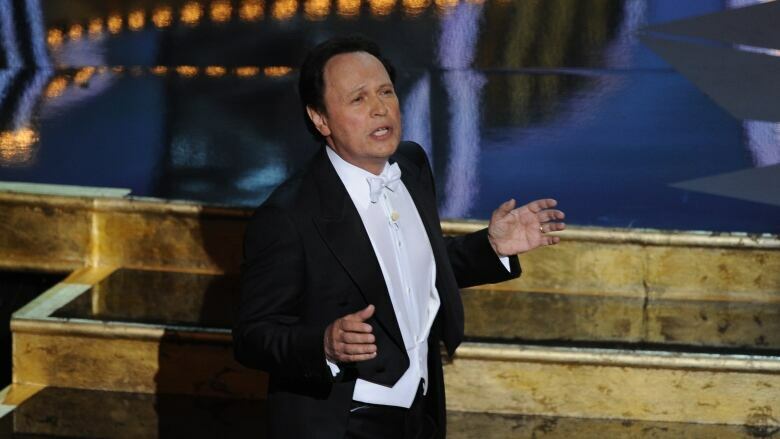 Ever since the Billy Crystal glory years, hosting the Oscars is the job that no-one seems to want. Kevin Hart took the gig for the upcoming show, and then walked away after his past homophobic comments caught up with him (you may remember that The National's Pop Panel took on this issue a couple of months ago). These shows are beset by controversies large and small, but you know what, when it comes to the big awards shows I'm a sucker for punishment. I'm still going to watch, and I suspect I'm not alone …. The Pop Panel will dissect it all tonight. Joining host Andrew Chang are Buzzfeed's Elamin Abdelmahmoud, writer and podcaster Anthony Oliviera, and writer and radio host Bee Quammie. Hope you'll join us! 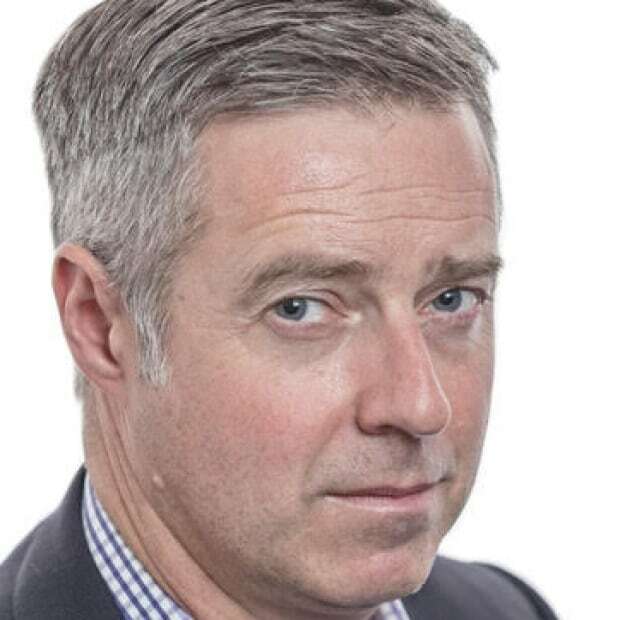 "Of course I don't want personal photos published, but I also won't participate in their well-known practice of blackmail, political favours, political attacks and corruption. I prefer to stand up, roll this log over, and see what crawls out." 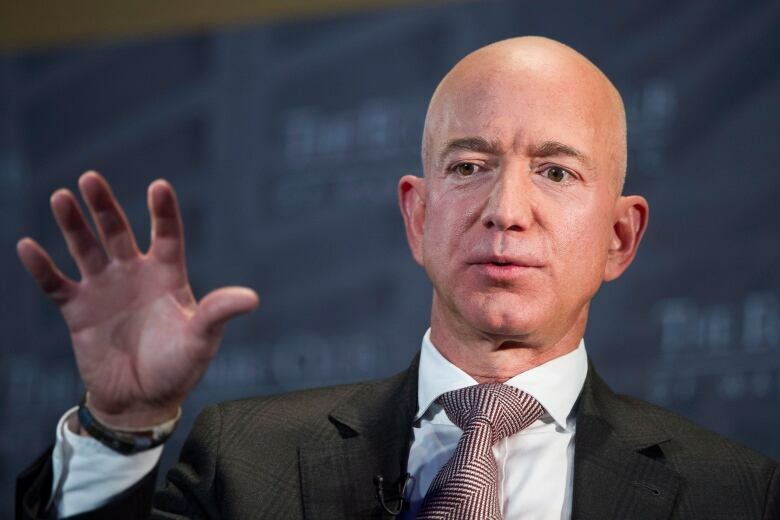 - Amazon.com founder Jeff Bezos, in an extraordinary blog post where he accuses the National Enquirer of trying to blackmail him with intimate photos that he sent to his mistress. University of Western Ontario psychologist Philippe Rushton received plenty of attention for his study suggesting that there was a racial hierarchy when it came behaviour and intelligence, with Orientals on top, whites in the middle, and blacks at the bottom. Geneticist David Suzuki took him on in a debate, saying the study was "pseudo-science" and methodologically unsound. Most of the crowd — and the world at large — agreed.